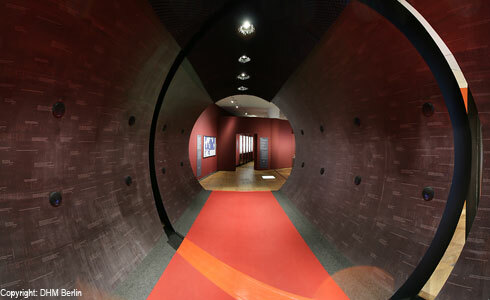 “The Sound Gateway” is an acoustic intervention that acts as the entryway into the exhibition “The German Language”. It is here that the visitor is sensitized to the phenomenon of language and simultaneously guided into the exhibition space. 16 loudspeakers are mounted in the tunnel-like entryway designed by Michael Hoffer. They are attached along the right and left interior of the tunnel in two rows of four mounted parallel to one another. This arrangement allows sounds to be directed through the space. The loudspeakers generate bursts of sound in a sound sequence guiding visitors from the tunnel entrance to the start of the exhibition. "Zur Ausstellung gehtes durch eine Tonschleuse. Deutsche und Ausländer reden Deutsch. Sprachfetzen des Alltags, Durchsagen, Medienstimmen, Lehrstimmen, Liebesgeflüster, Gedichte. Manche hören minutenlang im Sprachtunnel zu."